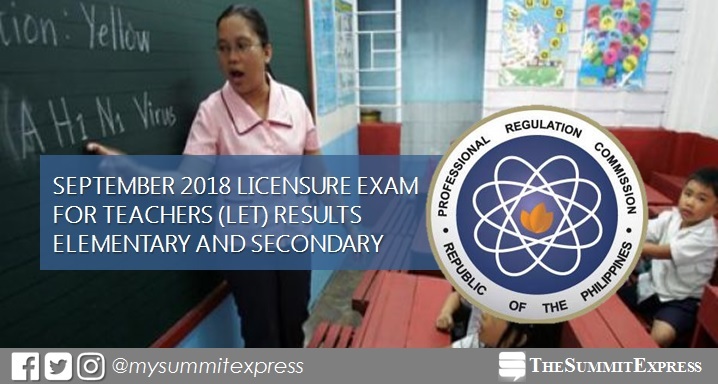 MANILA, Philippines – (Updated December 9) The September 2018 Licensure Exam for Teachers (LET) or teachers board exam results including the official list of passers, topnotchers (top 10), top performing schools and performance of schools for Elementary and Secondary levels are released online today, December 7, 2018 or in 52 working days after the exam. The Professional Regulation Commission (PRC) announced that 18,409 elementary teachers out of 90,750 examinees (20.29%) and 60,803 secondary teachers out of 126,582 examinees (48.03%) successfully passed the exams conducted on Sunday, September 30, 2018 in at least 25 testing centers in the country. "The results of examination with respect to five (5) examinees were withheld pending final determination of their liabilities under the rules and regulations governing licensure examination," PRC said. The members of the Board for Professional Teachers (BPT) who gave the licensure examination are Dr. Rosita L. Navarro, Chairman; Dr. Paz I. Lucido, Vice Chairman; Dr. Paraluman R. Giron and Dr. Nora M. Uy (on leave), Members. The September 2018 LET covered two (2) parts for Elementary - General Education (40%) and Professional Education (60%) and three (3) parts for Secondary - General Education (20%), Professional Education (40%) and Specialization (40%). The computed total number of workdays excludes 9 Saturdays and Sundays and three (3) holidays namely — All Saints' Day (Thursday, November 1), special non-working day (Friday, November 2) and Bonifacio Day (Friday, November 30). Note that results may be released earlier or beyond the target date due to several factors such as the total number of examinees, effect of work cancellations due to calamities and unforeseen events and system of checking the pencil-based tests. In the September 2017 LET, results were out in 43 working days after the exam. A total of 21,198 elementary teachers out of 80,509 examinees (26.33%) and 49,626 secondary teachers out of 107,020 examinees (46.37%) successfully passed the tests. University of Santo Tomas (UST) led the schools in the Elementary level while University of the Philippines - Los Banos (UPLB) dominated the Secondary level exams. In the September 2016 LET, results were released online in 48 working days after the exam. PRC announced that 23,378 elementary teachers out of 77,466 examinees (30.18%) and 31,334 secondary teachers out of 92,754 examinees (33.78%) successfully passed the exams. UST and University of the Philippines- Diliman (UPD) topped the schools for Elementary and Secondary exams, respectively. In the September 2015 exams, PRC announced results in 48 working days. A total of 21,461 elementary teachers out of 68,442 examinees (31.36%) and 34,010 secondary teachers out of 81,463 examinees (41.75%) successfully hurdled the exams. UST topped both the Elementary and Secondary levels. November 4, 2018 Update: Reliable source and the 'ultimate reviewer' of CBRC Dr. Carl Balita on November 1 shared that results will be released this month. "NOVEMBER is the MONTH that the Lord has made. LET us rejoice.... who will be LPTs soon?" November 18, 2018 Update: Latest information claims that LET results will be released early December. "...got reliably informed na tatawid sa LAST month ang LET results." December 5, 2018 Update: PRC has no words yet on the delay of announcement of LET results. But we advise examinees to continue monitoring for the updates until Friday, December 7. December 6, 2018 Update: Tomorrow is the big day! LET results are expected to be announced tomorrow according to a reliable source.